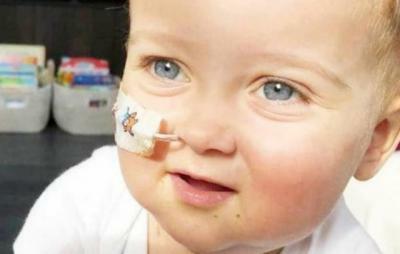 ROME – Alessandro Maria Montresor, a 19-month-old boy who desperately needs a bone marrow transplant, has arrived in Rome from London's Great Ormond Street Hospital and will be transferred to the Vatican's Bambino Gesú hospital, according to his family. Hospital sources said that Alex was in "good" condition, adding that the treatment started in London "is contributing effectively to the containment of the disease," the rare condition hemophagocytic lymphohistiocytosis, known as HLY, which affects just 0.002 percent of children. In October, the Insider reported that Alex’s parents were facing a race against time to find a bone marrow donor (http://www.italianinsider.it/?q=node/7333). Now, the parents confirm that a donor has been found, but would only be available from Jan. 2019, which they fear would be too late for their son. “The Great Ormond Street Hospital,” Paolo and Cristina wrote on their Facebook fundraising page earlier in the week, “has proposed that Alex is transferred to the Bambino Gesú hospital in Rome.” The hospital of the Holy See is reportedly a proponent one of the most innovative bone marrow transplant techniques in the world, which has, to date, cured 85 percent of the 50 children it has been performed on. Without a current donor, Alex’s parents have continued to appeal to as many potential donors as possible. “We urge you to continue to enrol in the Italian registry of bone marrow donors to give hope to the many Alessandro Marias who are waiting and struggling in anticipation,” their latest Facebook post reads. The story has garnered media attention both in the UK and Italy and many have consequently signed up to the registry. If a donor isn’t found in time for Alex, either of his parents’ bone marrow could be used for the treatment. However, experts have warned that there is only a 50 percent compatibility between a child and their parent. The Vatican hospital has previously used the bone marrow of siblings, which is a far more preferable choice for transplantation, though as an only child, this option is not available for Alex.